Chinese scientists say they’ve accomplished something that’s long been a goal in the world of regenerative medicine—giving someone a new, perfectly compatible (external) ear, freshly grown in the lab. What makes the feat a world-first is that the ear was made using that person’s very own cells. The experimental procedure was performed on five children, ages six to ten years, with an underdeveloped ear, a condition known as microtia. Currently, the only cosmetic treatments available involve grafting on a synthetic ear, which can be rejected by the body, or an ear roughly sculpted out of rib cartilage by a surgeon, which often looks less than natural. The researchers created a 3D-printed replica of each child’s normal ear (obtained via a CT scan), but with the dimensions reversed. This replica was then used to create a mold littered with tiny holes and made out of biodegradable material. The mold was filled in with precursor cartilage cells taken from the children’s deformed ear that were further grown in the lab. Over 12 weeks, the cells started to grow into the shape of the mold, replacing bits of it that had already disintegrated. This part-ear/part-mold was then grafted onto the children, some of whom required their own 12-week long procedure that stretched out their skin wide enough to accommodate it. The first surgery was performed two and a half years ago on a six-year-old, with the latest operation taking place just two months ago. So far, the ears have stayed put, with no signs of the body inadvertently absorbing or rejecting the material. Cartilage has also continued to gradually replace the mold, resulting in a more natural-looking ear over time. The team’s results were published in the journal EBioMedicine. Scientists have been trying to grow the perfect ear replacement for decades. They’ve been partly inspired by the so-called earmouse: A photograph taken from a 1997 study (which at least one of the current study’s researchers co-authored) that seemingly showed a lab mouse with a human-looking ear growing out of its skin. The ear was actually just cow cartilage shaped to look like one that was grown on a ear-shaped scaffold and grafted onto the mouse, but it nevertheless seeded the idea (and for some people, fear) of someday being able to mass-produce needed body parts and organs. According to Professor Bruno Peault, a regenerative medicine expert based at the University of Edinburgh in the U.K. as well as at UCLA, creating a new ear from scratch has also been a tantalizing goal because of how relatively simple it would be. Ears are basically just cartilage and skin, so it’d be a stepping stone in learning to bioengineer tissue that can be readily accepted by the body. “It’s a relatively low-hanging fruit,” Peault said, who is unaffiliated with the current study. Peault and his colleagues in the U.K. and U.S. have been working on a similar project using 3D-printed scaffolds to grow new ears. Their method, however, uses stem cells purified from the patient’s fat tissue that can be guided into becoming cartilage cells. Ideally, Peault said, these cells, rather than the precursor cells taken from the ear that the Chinese scientists used, would make for a more stable base on which to build a new ear from. “They’re using something that’s not as pure, but may still work,” he said of the Chinese team’s methods. Peault’s team is still collecting the research needed to win approval for human trials of their method; it might be another one to two years before that might become a reality. Regardless, he is ultimately heartened by the new findings and what they mean for his field. “Certainly there is a bright future for these strategies,” he said. Meanwhile, the scientists behind the current study plan to monitor their patients for at least five years, in order to make sure the ears stay intact even after the scaffold has completely broken down. 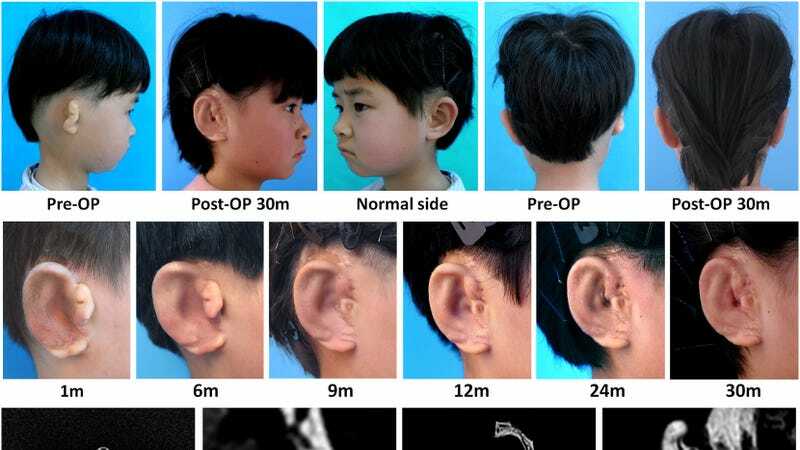 They also hope to refine the procedure to avoid the complications seen with some of their patients, like scarring and a slight deforming of the new ears over time.